Global shipments of OLED TVs are expected to hit 1 million units in the fourth quarter of 2018 to set a new record, industry watchers said Wednesday, as high-end TVs have become more affordable. Market watchers sales of OLED TVs will likely break the previous record, especially since the period is the peak shopping season for consumer electronics as retailers offer large discounts. IHS Markit earlier expected shipments to reach around 929,500 units in the October-December period. 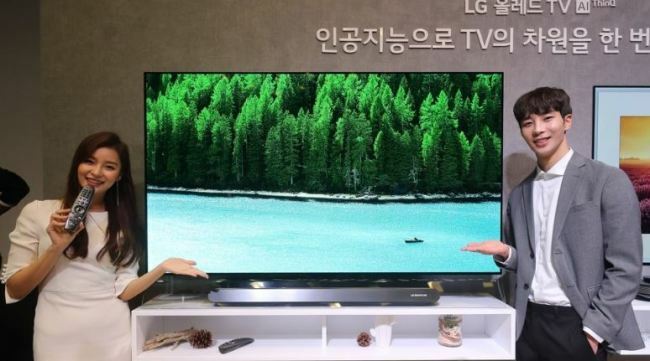 LG Display Co., a leader in the OLED panel market, recently claimed its OLED TV panel production will reach 2.9 million units for this year. This is also higher than IHS Markit's estimation of 2.54 million units of total OLED TV sales. "In the OLED TV market, the shipment of panels is equal to the production of TVs," an industry watcher said. The falling prices of OLED TVs are boosting the rosy outlook as well.